The Government has set a target of doubling of farmers' income by the year 2022. 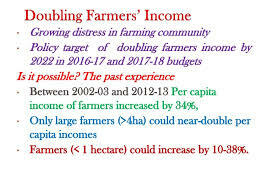 The Government has constituted an Inter-Ministerial Committee under the Chairmanship of Chief Executive Officer, National Rainfed Area Authority, Department of Agriculture, Cooperation and Farmers Welfare to examine issues relating to doubling of farmers' income and recommend a strategy to achieve doubling of farmers' income in real terms by the year 2022. During the National Conference on “Agriculture-2022 - Doubling Farmers' Income,” Hon'ble PM has mentioned four aspects for improving the income of farmers, viz; reducing input cost; ensuring a fair price for the produce; reducing wastage; and creating alternate sources of income. Further, NITI Aayog has constituted a Task Force for demonstrating doubling of farmer's income through new business models and relieving farmers' distress. The government announces minimum support prices (MSPs) for 22 mandated crops and fair and remunerative price (FRP) for sugarcane on the basis of recommendations of the Commission for Agricultural Costs & Prices (CACP), after considering the views of State Governments and Central Ministries/Departments concerned and other relevant factors. The mandated crops are 14 crops of the kharif season viz. paddy, jowar, bajra, maize, ragi, arhar, moong, urad, groundnut-in-shell, soyabean, sunflower, sesamum, nigerseed and cotton; 6 rabi crops viz. wheat, barley, gram, masur(lentil), rapeseed/mustard and safflower and two other commercial crops viz. jute and copra. In addition, the MSPs of toria and de-husked coconut are fixed on the basis of the MSPs of rapeseed/mustard and copra, respectively.